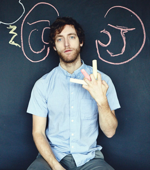 Actor Thomas Middleditch plays a nerd on HBO's Silicon Valley, but apparently he's actually very cool in real life: he plays GURPS. The actor talked about his favorite RPG on Late Night with Stephen Colbert. Stephen is a bastion of geek knowledge himself, so the fact that Mr. Middleditch was able to school him a bit on our game was pretty neat in and of itself. As if one name drop wasn't enough, he also mentioned GURPS in a CNET interview! If you haven't checked it out yet, or are new to RPGs, GURPS Fourth Edition is a great jumping-on point. Open up your world to any setting you can imagine, and take the dive into a really fun game with limitless possibilities. With all this heat, we should work on a new tagline. How about: "GURPS - RPG of the Stars"!